Links to articles and videos that have caught my eye in the past week or more – thanks, as always, to those on Twitter and elsewhere that drew my attention to them. • The fashion photography of Marilyn Stafford – in pictures: glorious images by the photographer who worked with Paris Haute Couture houses in the 1950s and took iconic images of ‘swinging London’ in the following decade. Courtesy of the Guardian and exhibitions at the Hull International Photography Festival, now finished, and Lucy Bell Gallery, Hastings, until 17 November; for more, see the Marilyn Stafford website. 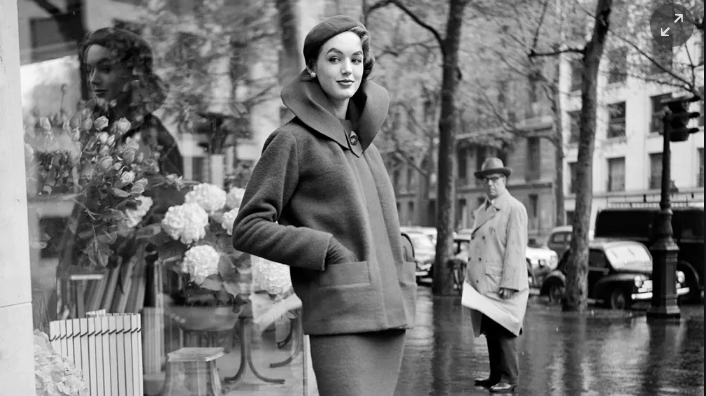 Above, a detail from ‘Paris Prêt-à-Porter 1960 on a rainy day’. I’m not very concerned with tracking down their factual accuracy. That’s an important task, but I want simply to study what [Wayne] Booth might call the rhetoric of nonfiction. By looking at each book’s plot structure (yes, they have plots) and narration, I want to understand how narrative analysis can help us better understand what counts as ‘reliability’. Fortunately for my purposes, the books nicely illustrate three different models of storytelling. • A very grim forecast: Bill McKibben reads Global Warming of 1.5°C: An IPCC Special Report by the Intergovernmental Panel on Climate Change (available at www.ipcc.ch) – you need to read this, from New York Review of Books. • What happens when your crime library goes up in smoke? : Jeff Abbott on losing his library of 2,500 books in a fire – and on how you can mitigate the loss; this is also a lovely piece about our personal relationships with books. In an era of neoliberal capitalism, the ‘publicness’ of the public library is an increasingly rare commodity. When everything is scrutinized under the cost/benefit analysis, our public libraries function like rebels, resisting the encroaching legion of policies that monetize all things in their path. The public libraries’ services to our democracy is more than what we can put down in an annual report. • Pretentious, impenetrable, hard work … better? Why we need difficult books: this Sam Leith essay at the Guardian is very, very good – and it is accompanied by Lara Feigel’s choice of ‘Ten difficult books worth reading’. • The BBC faces a cash crisis just as live viewing of its terrestrial channels is falling off a cliff: useful from Roger Mosey at New Statesman for those of us concerned about the future of the corporation. • The Hollow Crown – an introductory essay: Peter Kirwan contributes a fine analysis of the two television series to Drama Online. • This too is Andy Warhol – shunned and swooned over – the story of an American revolutionary in eight works: you might think there’s little more to say about Warhol, but you may be surprised by Jerry Saltz writing for New York magazine on just eight artworks. • Unbounded vistas – rom panoramas to virtual reality: Jenna Ng, Head of Interactive Media at the Department of Theatre, Film and Television at the University of York, posts at the site of The Bill Douglas Museum about the origins of VR in 19th century panoramas. • In the age of A.I., is seeing still believing? : an im[ortant piece by Joshua Rothman for The New Yorker about ‘image synthesis’ and fake news; together with a substantial footnote by Rothman on the disputed video of Jim Acosta Tweeted by the White House. • Armistice day: victory and beyond: a rich Neal Ascherson essay for the Guardian on the legacy of the First World War. • Armistice day in ‘art’ and popular culture: also from Lawrence, an account of how people responded to that day from the opening of his book The Great War in British Popular Cinema of the 1920s. • Plot 6, row C, grave 15: for London Review of Books, Malcolm Gaskill tells – beautifully – a story of a First World War pilot, of England and America, of spiritualism, and of the archive.